East-Tec Eraser 2010 is a powerful, simple-to-use Internet privacy software which designed to protect your private identity and confidential information, as well as clean all evidence of your computer and Internet activities. East-Tec Eraser 2010 normally costs $49.95 per 1-year single license. As part of PC Advisor promotion, interested users can grab a free 6-month license serial key for East-Tec Eraser 2010 full version. Visit the promotion page to complete a registration form. Shortly, an email from EAST Technologies Support containing a link (Get Free Key) will be delivered to your registered inbox. Click “Get Free Key” and you will see a new web page. 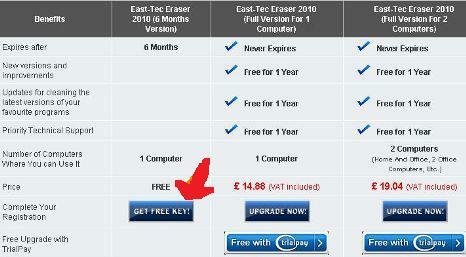 Press “GET FREE KEY!” and you will see your free license code for East-Tec Eraser 2010 instantly. Download the setup installer of East-Tec Eraser 2010 from here.